Combine the relaxing fun of kayaking across the tropical rainforests of Havelock with snorkelling in the deep, blue Andaman Sea. For three hours on the calm and quiet tides of the ocean, you'll paddle in your kayak to views of sprawling mangroves. After an hour on the sea, you'll approach a shallow reef and jump into the waters for a session of snorkelling. Put on your masks and peer inside a magical world of brightly coloured fishes and coral reefs. An experienced guide will accompany you throughout the trip to teach you the right way to kayak and guide you in snorkelling. NOTE: Travellers are not required to know swimming in order to book this kayaking and snorkelling trip in Havelock Island. The Havelock Island, the capital for all water sports and India's best kept secret, offers gorgeous views of Andaman's natural beauty. From acres and acres of open forests to large coral reefs deep underwater, the island's attractions make for an excellent destination to go kayaking and snorkelling. While most travellers to Havelock make a beeline for scuba diving, kayaking and snorkelling are two of the relatively little-known water sports of Havelock. The island is also known its relaxed vibe with its exquisite beaches lined with palm trees and soft sand. • Go kayaking and snorkelling at Havelock Island. • Spot marine life and shallow reefs while snorkelling. • Relax with spectacular views of the island. • Paddle your kayak in the Andaman Sea around Havelock Island. 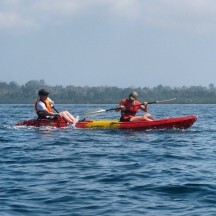 Travellers are required to follow instructions of the tour guide while kayaking and snorkelling at Havelock Island. For cancellations made more than 48 hours before departure of the Havelock Island kayaking and snorkelling trip: 100% refund. For cancellations made less than 48 hours before departure before departure of the Havelock Island kayaking and snorkelling trip: 50% refund. The timings for the kayaking and snorkelling at Havelock Island may differ according to weather conditions, tide levels and traveller convenience. The tour operator takes utmost care to ensure safety of the travellers and shall not be held responsible for any mishap, accident or loss of life while kayaking and snorkelling at Havelock Island. There is no pick-up for this Havelock kayaking and snorkelling trip. There is no drop-off for this Havelock kayaking and snorkelling trip. Go kayaking and snorkelling at Havelock Island! Meet your tour guide at the Havelock Jetty at the allotted time. Here, you'll kit up and have a quick briefing session before boarding your kayaks. Learn to paddle and navigate the kayak along with your tour guide. After you feel comfortable with the kayak, you'll paddle through some gorgeous landscapes of Havelock's tropical rainforests until you approach a shallow reef. Here, you'll jump out into the sea for an engaging session of snorkelling. After the session, you'll kayak back to the Havelock Jetty. Your trip ends here. No meals or accommodation are provided in the package. However, light refreshments including juice and biscuits will be available. The Havelock Jetty is accessible via a ferry ride from Port Blair. You can board a flight to Port Blair's Veer Savarkar Airport and take a ferry to the Havelock Jetty.